An extremely attractive example of S. A. Mitchell Sr.'s 1853 map of Chili, La Plata and Uruguay. Covers the south part of South America from Bolivia and Paraguay south to Tierra del Fuego. 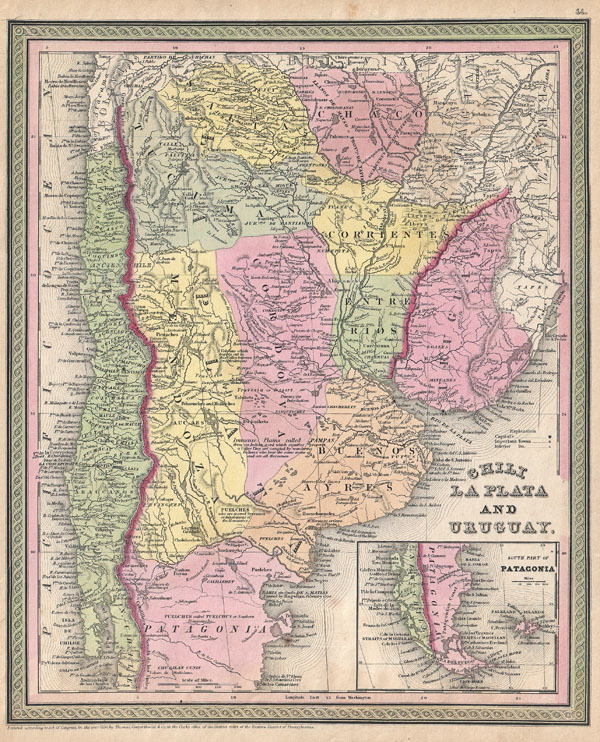 Includes the modern day nations of Chili, Argentina and Uruguay with parts of Bolivia, Paraguay and Brazil. An inset in the lower right quadrant details the southern part of Patagonia, Tierra del Fuego, and the Falkland Islands. Shows South America's highest mountian, the 'Volcan de Aconcagua,' on the border between Mendoza and Chili. Offers various interesting annotations regarding the indigenous peoples of the region. Color coded according to region. Surrounded by the green border common to Mitchell maps from the 1850s. Prepared by S. A. Mitchell for issued as plate no. 44 in the 1853 edition of his New Universal Atlas. Rumsey 0537.043 (1846 edition). Phillips (Atlases) 6103-42.